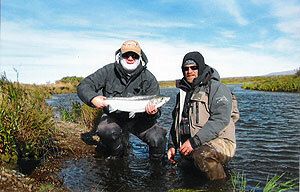 Fish Alaska, Rocky Mountain States, Great Lakes Tributaries, Pennsylvania Spring Creeks and Salt Water Destinations. July 6 - 12, 2019: Upper Cannon Outfitter - Ruby River, Montana Call for Details! August 26 - September 2, 2019 No-See-Um Lodge - Bristol Bay, Alaska (possibly one of the best weeks of the season). The rivers are loaded with Salmon eggs. the Rainbows, Char, and Grayling are gorging. Silver Salmon are fresh from the ocean ready to strike almost anything in their path. Call for Details! Several spots available for Fly Fishing trips - Call 724-463-2011 for details!